Disclaimer: Thank you Ghirardelli for providing product for this post. I was not compensated for this review and all opinions included here are my own. Tomorrow I am heading out to Colorado to meet up with my boyfriend. He is FINALLY coming back from Europe. Who am I kidding, he has only been gone since Friday, but still! Being home alone to me means nothing more than watching trashy television, having cereal for dinner and finishing the night with a glass of wine. Ain’t no cooking happening over here. I recently discovered the show Rich Kids of Beverly Hills, totally ridiculous, but I can’t turn it off. I stayed in my PJs literally almost all weekend except when I drove 2 minutes to Whole Foods to get dinner, at which point I realized I forgot to put makeup on. Get yourself together Julianne. Anyway, I am super excited to see him and spend a couple days in the mountains this weekend! It will be good to ride on some actual snow, cause we don’t have any of that here! Donut day number two. Did you see the Maple Bacon Donut Fries I posted on Monday? If you haven’t guessed already, I did some serious deep frying this weekend. 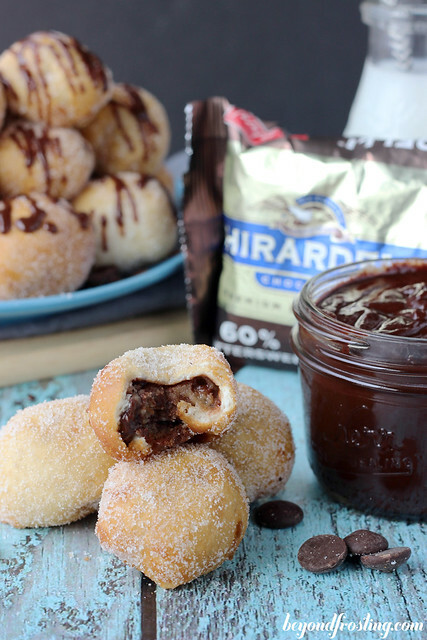 Today’s donut delight is a Ghirardelli Cookie Dough stuffed Donut Holes with Chocolate Dipping Sauce. This idea was a no brainer to me. After I saw Tieghan’s recipe this week, I had a craving for cookie dough. 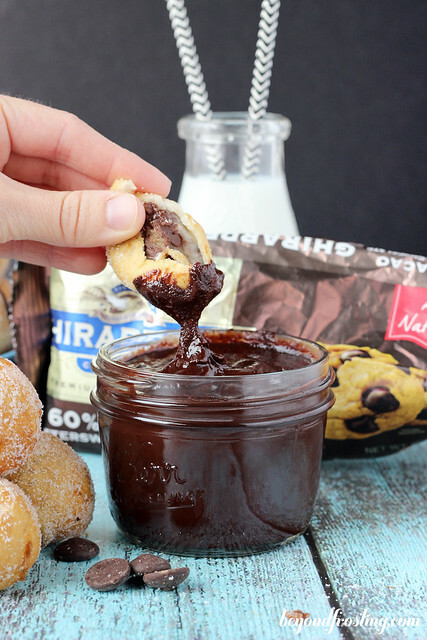 I have made several versions of a deep fried cookie dough (see here and here), but the donut wrapped around this dessert just takes it over the top. I am ecstatic to be working with Ghirardelli again. With all the baking I do, I am partial to the brands I bake with. Ghirardelli is one of them. I absolutely love their baking chips, I practically buy bags by the dozens. Since I am a dark chocolate fan, I always have bags of the 60% Cacao Bittersweet Chocolate Chips. These baking chips are made with a proprietary blend of quality ingredients that are perfect for a wide variety of recipes. However, my boyfriend prefers the milk chocolate baking chips, so we usually have both in the freezer. This cookie dough is packed with chocolate. First, I ground up some baking chips and mixed them in the dough so you have chocolate in every bite. Then I added whole baking chips to keep the cookie dough effect. 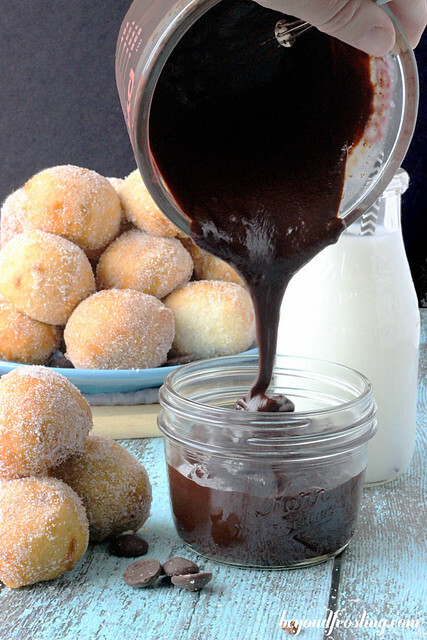 After deep-frying the donuts, the chocolate melts on the inside creating a mouthwatering treat. 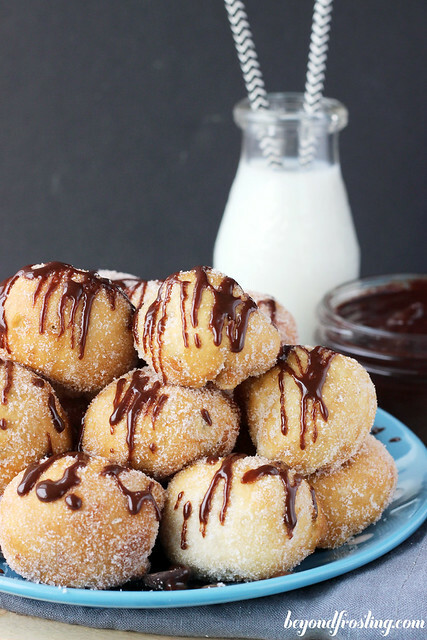 These stuffed donuts come together pretty easily. First, make some eggless cookie dough and then take some home-style biscuits and roll them out flat. Wrap the cookie dough with the biscuit and drop it in the fryer. After about 30 seconds, it turns a light golden brown. After you remove it from the oil and let it cool, roll it in some sugar and drizzle with chocolate. 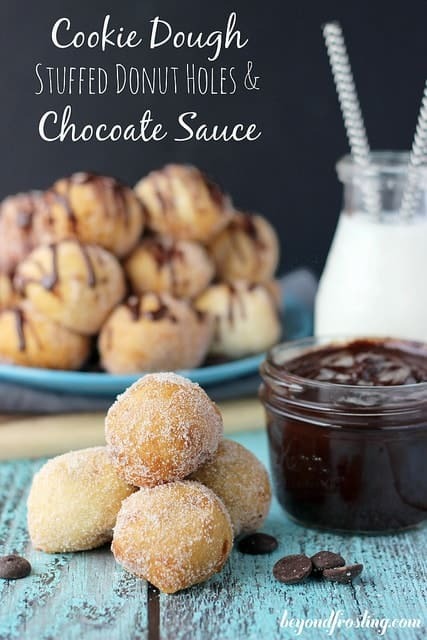 I served this with a chocolate dipping sauce, which was so easy to make. 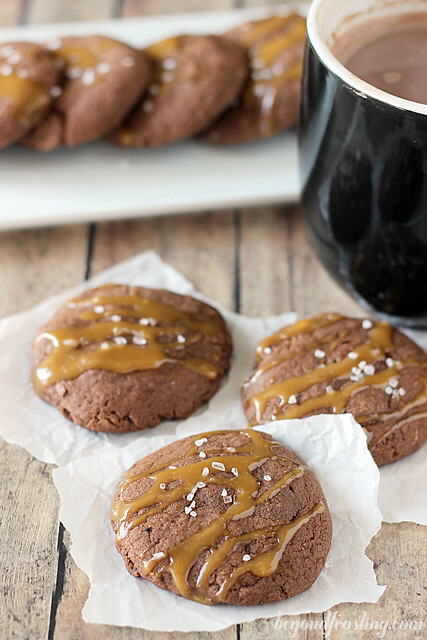 I just combined Ghirardelli 60% Cocao baking chips with heavy whipping cream, You can either drizzle this over the donuts or serve the sauce on the side. Microwave butter for 15 seconds to soften. Add flour and salt and mix just until combined. Mixture will be crumbly. Add vanilla extract and milk. Mix until dough is soft. In a food processor, take ¼ C baking chips and blend to break into tiny pieces. Add both chocolate baking chips and shredded baking chips last. Roll dough into balls, about 1 tablespoon for each. Set aside. In a medium sized pot, empty a full container of vegetable oil. Attach a candy thermometer to the right side of the pot. Heat oil over medium heat until it reach 360-375° F. Turn your heat down slightly to prevent the oil from getting too hot. Use extreme caution, oil will be very hot. Take one of the biscuits and roll out very thin, to about the thickness of a nickel. Cut out circles about 2-2.5” in diameter. Wrap biscuit dough around a ball of cookie dough. Make sure to pinch the edges tightly and roll the biscuit dough in your hands to smooth. Once oil is heated, slowly drop dough into oil. Bake for about 20-30 seconds a side until golden brown. Remove with a pair of tongs and set on a paper towel lined plate to drain the excess oil. Allow to cool and roll in sugar. Prepare the chocolate sauce. 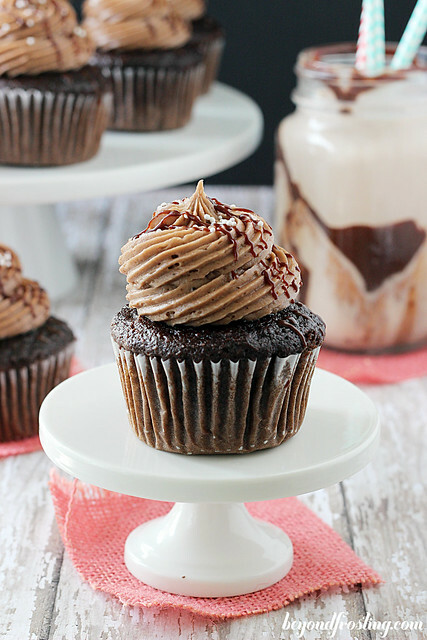 In a microwave proof bowl, combine 1 cup of chocolate baking chips and 4 tablespoons of heavy whipping cream. Microwave on high for 60 seconds. Remove from microwave and whisk until smooth. When finished deep-frying, leave your candy thermometer in the oil until it is completely cooled. 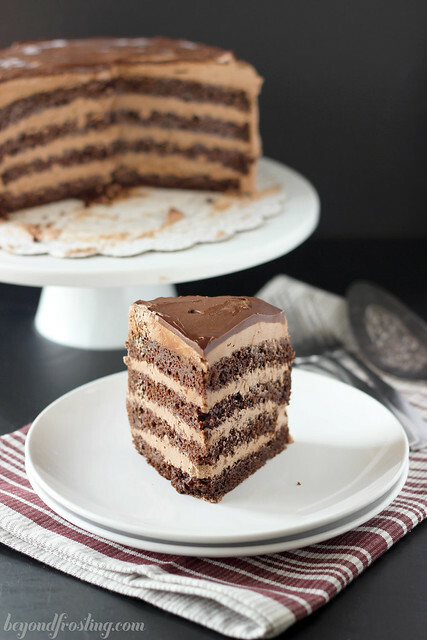 Love all the variations, but I will take chocolate with chocolate and more chocolate any day! 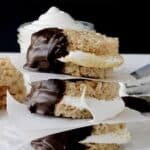 This is a great recipe and looks easy to follow too. Oh I hope you will try it! They look so cute and funny. I love them so much ! Can’t wait to make my own donut with your recipe. Thank you so much !! That sounds great Anthony! Let me know how they turn out! You’ve got amazing recipes on the board!